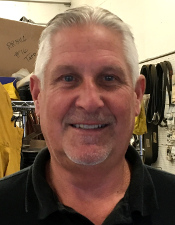 Kevin has been with the company since 2014 and his background includes being a previous family business owner and government shipyard facilities and equipment manager. Kevin spends his days managing all aspects of a working shop and writing work estimates. He also works to facilitate the packing of consumable products for local pick up or shipment to our customers. He works at our headquarters in Pittsfield, Maine and can be best reached @ 1-800- 451-8838 or kevin@hydrograsscorp.com.